There is a little golden light outside the window this morning. It’s cold — very cold, the actual temperature still below freezing and the wind chill much lower yet — and we sit in the embrace of low gray clouds on all sides. But the sun has now gained the ridgeline, and every now and then, its glow manages to pierce the veil surrounding us, turning the no-longer-quite-bare willow branches and the sides of the wooden structures the color of amber flames. Winter is the long season here, one that arrives early and departs late, although within that time it periodically cedes ground to warmer winds. It knows that its time grows short; the meadowlark returned yesterday evening to call beneath the gray of the gathering storm, and it was up before full sun this morning, as though to remind winter of its inexorable fate. Spring arrives, at long last, not only on warmer winds but also on sunny wings. Summer departs and autumn arrives on sunny wings. The small fierce spirits of this threshold season infuse this work by Wings, a tiny silver hummingbird who carries the sun itself. The wingéd one is cut freehand out of sterling silver, with wings outstretched in full hover and dagger-like beak at the ready. A triangular point defines the beak; a single lengthy score line separates the wings. Sunrise symbols in two sizes delineate body and edge of wing feathers; the tailfeathers are formed by a flowing-water motif and edged with arrowhead points. Where wings join body, a single small round cabochon rests in a saw-toothed bezel: fiery orange amber, the color of the autumn sun in a place and space of magic, mystery, and medicine. Pin stands 1.5″ high by 2-1/8″ across at the widest point; amber cabochon is 3/16″ across (dimensions approximate). A cold rain is supposed to appear late in the day, although yesterday’s failed predictions don’t inspire much confidence. we were supposed to get snow, and snow there was . . . on the peaks and around the edges. Here, it remained stubbornly dry, if windy and very, very cold. For the moment, the northeast sky seems to be clearing a bit. I say “seems to be,” because that small blue gap is flanked on both sides with heavy gray, small bits of cloud drifting to meet in the center. To the west, the skies remain alternating shades of pewter and iron. And the air itself is as cold as the edge of an old, old blade. And yet, the sun manages to glow behind the shrouded peaks to the east. The air is still bright. And the earth here is lit by the meadowlark’s song, awash in a little golden light. Posted on Saturday, April 13th, 2019 at 9:14 am. 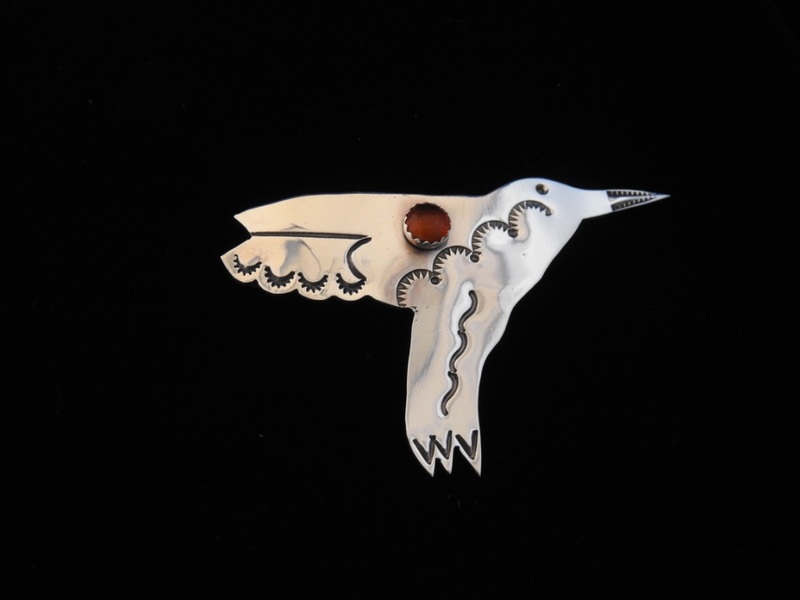 Filed under: The NDN Silver Blog Tags: The NDN Silver Blog	RSS 2.0 feed.